With Malaysian political cartoonist Zunar facing yet another government investigation for sedition, the international cartooning community is rallying to spread the word and pressure Malaysian authorities to leave him in peace. Nearly all of Zunar’s books have been officially banned in Malaysia at some point. There was a glimmer of hope in October of this year when an appeals court lifted the ban on two books and observed that “law of sedition [was] being used as a convenient peg to control freedom of expression,” but government authorities have appealed that decision as expected. 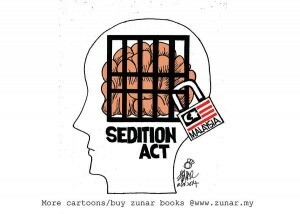 Moreover, less than a month later three of Zunar’s assistants were arrested for selling books in public and the police informed him of the new sedition investigation regarding his latest release, Komplot Penjarakan Anwar. Even though that book has not yet been officially banned, authorities attempted to obtain a list of customers who bought it from the payment processing company used on Zunar’s website. Zunar must be recognized internationally and domestically as the patriot and hero that he is. Every Malaysian citizen should understand that he risks his life on behalf of everyone, and he does it in defense of the honor of Malaysia and in the name of the Malaysian Constitution. Zunar has deeply internalized the Constitution’s guarantee that he and every other Malaysian citizen…has the courage, the right to be such a patriot. For more than 20 years I have been monitoring the activities of political cartoonists who are in trouble because [of] the power and influence of their work. I am constantly in awe of them. They are not all as dynamic and feisty and stubborn as Zunar, but they all exhibit a courage and the dignity which exemplifies the best of the human spirit. As the famous American humorist Mark Twain once said, ‘Against the power of laughter, nothing can stand.’ Zunar, along with so many of his associates who suffer along with him, are the hidden heroes of every modern democracy. If the political leaders in Malaysia really understood what they were dealing with, they would just let him alone. They would allow him to publish his cartoons, and thus stop being the source of so many wonderful stories about unethical and illegal censorship in Malaysia. Zunar will also be recognized next month in Gothenburg, Sweden, where his work will appear in the second annual Sketch Freedom International Cartoon Expo. Organized by exiled Iranian cartoonist Kianoush Ramezani, the exhibit at the Regional State Archives of Gothenburg will present the work of 26 cartoonists from around the world that “manifest[s] the value of freedom of expression.” Someday we hope that Zunar will have the same freedom to publicly share his work in his native country!